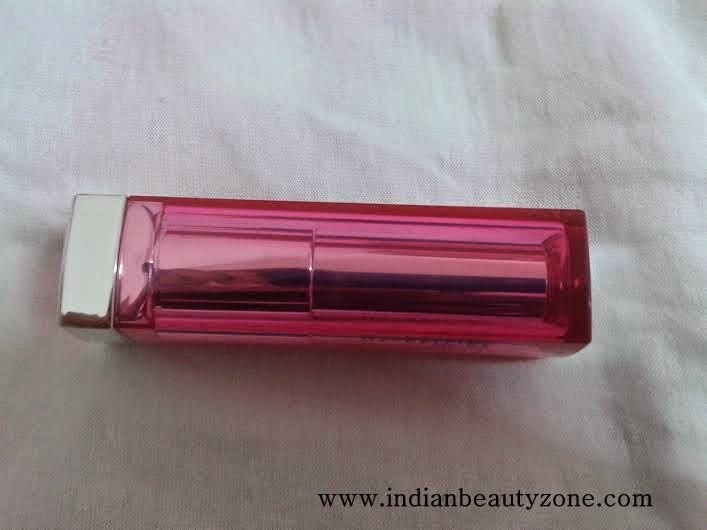 Available online on nykaa, snapdeal, flipkart, etc and at all offline beauty stores. • Passionate Pink color only from our vivid color pigments. The entire ingredients list is mentioned but it’s too tiny. So I’m just mentioning the key ingredients which are: Dimethicone, beeswax, tin oxide, aluminium hydroxide, titanium dioxide, mica, silica. These lipsticks come in a pretty pink packaging with a plastic wrap which screams “PINK ALERT”. It has a color coded sticker at the bottom with shade name. The cap shuts tightly and won’t come off even if it’s rolling around in your bag. 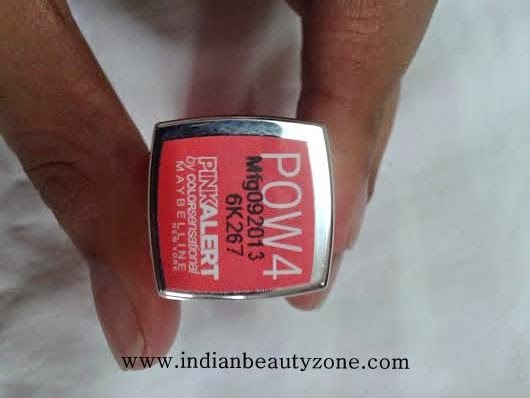 POW 4 is a gorgeous coral pink shade. 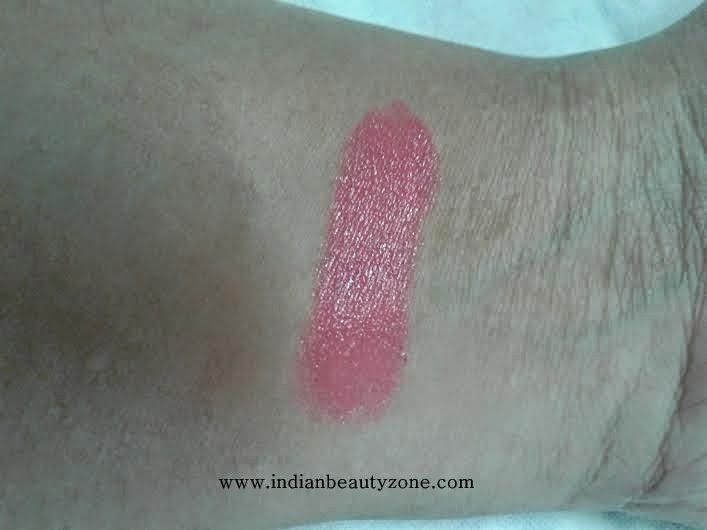 It’s such a gorgeous shade which would suit the Indian skin tone well especially fair to medium skin tones. It complements my skin tone really well. Its not as bold as the other shades from this range. Its my go to colour these days! Its an exact dupe of Maybelline Bold Matt shade Mat5. 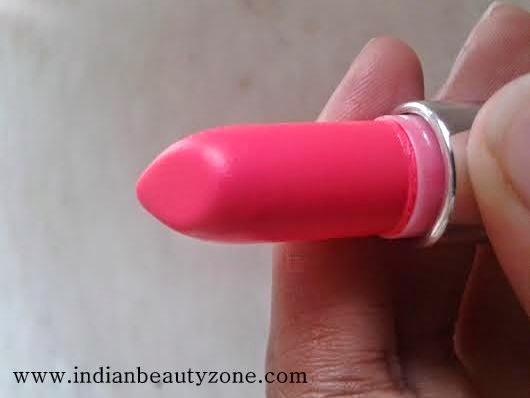 I wonder why Maybelline has launched the same colour in two ranges.The texture is really smooth and glides on the lips like butter and its quite hydrating. It has a semi matte finish. It doesn’t bleed or settle into lines but does transfer a bit due to its texture. The pigmentation is decent. When I used Pow 2 maximum two swipes were needed to cover my pigmented lips. In case of POW 4 you need to layer to build up color and then it kinda looks chalky so I prefer just one swipe or max two. It stays on for about 4 – 5 hours and leaves a pretty stain on the lips. Maybelline products are always high on quality! I simply loved this lipstick and I’ll definitely urge you to buy one from this range. As I said in my earlier post as well if you are fair skinned beauty – your luck has favored you... all four shades will suit so go on and make a choice or simply buy all four. If you are a medium skinned beauty - pick POW 2 or 4 those are the safest bets but there’s no harm in experimenting with the other shades if they suit you. For the dusky beauties – I’m honestly not so sure how POW 2 or 4 will look on you... do try them out and if it suits you then pick it up without hesitation. Also, if you already own MAT 5 skip this, it’s the exact same colour though the overall finish of the lipstick is different!!! Go and get your Pink Alert Lipstick! 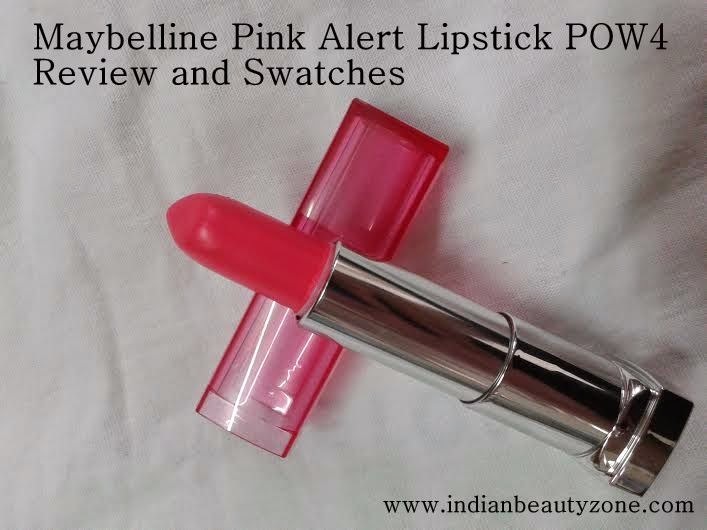 I love pinks and this one is no exception... great review Karishma! That's a nice lip color! One of my fav brand for lipsticks but like you said, chalky and the shade; not for me. I am yet to try these! they are such lovely shades!!! I so want this shade now...got the Pow 2 7 now will get this one. The shade looks Amazing ! Lovely Shade!This is one shade I liked among the 4 shades.